In an era of fast and profound change, Canadians need to be adaptable and resilient so that they can spot the opportunities to create jobs, drive growth across all industries and improve lives. The country is at its most prosperous when everyone has a fair chance at success. Innovation is the path to inclusive growth. It fosters a thriving middle class and opens the country to new economic, social and environmental possibilities. It is essential in shaping our future. That's why Canada needs an inclusive plan to foster a confident nation of innovators—one that is globally competitive in promoting research, translating ideas into new products and services, accelerating business growth and propelling entrepreneurs from the start-up phase to international success. The way forward is to act on a bold new vision: to build Canada as a global centre for innovation. To help put the country on a firm path to long-term growth across all industries, Innovation Leaders have been identified to lead round-table discussions that will take place across the country. These leaders represent the private sector, universities and colleges, the not-for-profit sector, social entrepreneurs and businesses owned and operated by Indigenous people. This collaborative approach is essential because the Government cannot act alone. Every sector of society must be mobilized for action. Each sector must also have a stake in determining what the targets to measure progress should be and how those targets should be tracked and reported. Canadians from all walks of life will also be asked to provide their thoughts and ideas to help build a nation of innovators. This collaborative approach is essential because every sector of society—from the business community to universities and colleges, the not-for-profit sector, social entrepreneurs and Indigenous business leaders—pulls some of the levers that drive innovation, growth and well-being. The Government can do its part by being nimble and open to new ideas. That means adapting policies and practices according to changing economic and technological conditions—and discarding those that don't work, scaling up those that do and measuring their impact along the way. However, the Government cannot act alone if Canadians expect to see meaningful results. Only by mobilizing every sector of society to do its part will all Canadians have the opportunity to participate fully in an innovation economy. That's why working together is so important. The need to act is urgent. Technology is reshaping the way Canadians access information, buy goods and services, interact with each other and build communities. It is creating an open playing field among countries, giving their citizens new-found ways to collaborate and compete globally. Entire industries are being transformed as markets and businesses race to adapt. Meanwhile, countries around the world are responding to climate change by moving more quickly to a low-carbon future. Canada must be on the leading edge of these changes. Canada has what is needed to develop a robust culture of innovation. We are recognized internationally for the quantity and quality of our scientific research. According to the Organisation for Economic Co-operation and Development (OECD), we ranked seventh for investment intensity in higher-education research in 2014. And Canadian researchers have consistently scored well in global measures of research quality. For example, we rank ninth out of the 34 OECD countries for the number of top-cited publications. Our country has generous tax incentives, a strong fiscal position and a welcoming business environment. We also have a skilled and highly educated workforce. Canada has the added advantage of being a culturally diverse society, with many Canadians bringing their knowledge, entrepreneurial skills and ties to other parts of the world. However, other countries are moving even faster to equip their economies to lead. Canada needs to take bold action to be in this innovation race. There's no reason why we can't be a global innovation leader, especially if we work together to address the gaps that are holding us back. Canada has strong research capabilities, yet needs to improve in transforming ideas into marketable products, services and business models. Canada's business expenditure on research and development has declined steadily for more than a decade, to the point where we rank 22nd among the 34 OECD countries. Canada has a strong record in starting businesses, with 78,000 new companies established in 2013. However, we have less success in developing companies to a global scale. Growing firms must have the ability to source top talent from anywhere in the world. Start-up companies, in particular, must also have enough financing to get them through critical stages of their development. When it comes to adopting new information and communications technologies, Canadian firms invest about half as much as U.S. firms do. This gap limits Canadians from participating fully in the digital economy, leading in science and creating new value for all industries. And as the world moves toward cleaner sources of energy, Canada needs to take full advantage of the role that it can play in addressing climate change. Our country's clean technology exports only represent about 1 percent of the global market share. Canada can achieve so much more. For many years, leading experts have studied Canada's growth and productivity issues, providing the Government with advice that informs the six action areas for an inclusive Innovation Agenda. The six areas for action reflect the Government's focus on people, technology and partnerships. It is impossible to predict where and how innovation will emerge. That's why Canada needs to be a confident nation of innovators. We need to prepare Canadians to embrace change, take smart risks and be resourceful enough to create their own opportunities. The goal of education should be to make every Canadian "innovation ready"—ready to spot opportunities, imagine possibilities, discover new ideas, learn and grow. Developing a mindset that fosters creativity, risk-taking and ambition to succeed in the global marketplace should start early in life. Science, technology, engineering and financial literacy should be taught alongside business, math, social science and the arts. Highly skilled workers, researchers and entrepreneurs should be welcomed to Canada in higher numbers and at a faster rate than in other OECD countries, which are competing for the same talent. Support should be provided to entrepreneurs and participants in promising social networks who aspire to turn their ideas into action to improve people's lives. Creativity needs to be harnessed; support needs to be provided to entrepreneurs who aspire to turn their ideas into successful businesses that improve people's lives and make the world a better place. Canada should be a leader in promoting social enterprise and social innovation. What does it take for Canada to be known globally as the best country in attracting and developing diverse, high-end talent? How do we work together to better equip our young people with the right skill sets for the economy of the future? Whether it's finding vaccines to fight viruses or developing new clean technologies, Canada's future depends on leadership in scientific discoveries and applications. A cornerstone of sustainable growth is the support of experimentation and exploration. Equally essential is providing the pathways to transform new ideas into solutions. This area of action focuses on strengthening basic and applied research capabilities, while promoting partnerships with businesses. Strong and sustained support for world-class research is critical to Canada's innovation performance. How can colleges play a larger role in the innovation ecosystem? As innovation is about people and businesses, how can we increase the demand for science, technology, engineering and math graduates? Canada needs to focus on developing world-leading clusters in areas where it has the potential to be, or is already known as, a hotbed of innovation. The goal is to make significant targeted investments in these clusters so that Canada can attract the best ideas, brightest talent and smart capital necessary for success. More partnerships should be fostered among businesses, research institutions and governments so that these hotbeds of innovation become magnets for global talent, investors and leading companies. These partnerships will strengthen value chains by connecting Canadian suppliers to large anchor firms, accelerating the commercialization of ideas and expanding market access. 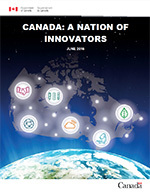 What is the right model for made-in-Canada innovation clusters led by businesses? What are the barriers to greater participation by Canadian companies in North American and global supply chains? This area of action focuses on supporting the start-up and scale-up of small and medium-sized businesses. Too often, firms that are established in Canada see their growth path diverted as ideas and talent move to other countries. The Canadian pathway to success depends on the capacity of these companies to export to multiple markets. It also depends on their access to patient financing and ability to attract top talent. This path begins with a strong network of business accelerators and incubators. More focus should be placed on strengthening supply chains, increasing global market share and creating jobs in Canada. In addition, building and accelerating the growth of clean technology companies will position them to succeed in global markets. Adopting clean technology more quickly across all sectors will also send a signal to the world that a green and strong economy go hand in hand and is a new competitive advantage. How can Canada better support the scale-up of innovative companies into the next generation of billion-dollar global players? Are there market-based approaches to encourage wider adoption of clean technologies by the private sector? This area of action focuses on maximizing the benefits of current and emerging digital technologies. Innovations in cloud computing, digital manufacturing, quantum computing and driverless cars promise to radically change the business landscape and reshape the nature of work. These innovations also promise to increase competition among businesses and offer consumers more choice. Canada needs to capitalize on these technologies to give businesses, research institutions and cities a competitive edge. Canada must also do more to give rural communities and low-income Canadians affordable access to high-speed Internet so that they can participate fully in a digital and global economy for a better quality of life. What's the future of digital infrastructure? Do we need to transition Canada there faster? Who are the partners? What are innovative ways to develop stronger digital skills among Canadians? The ability of nations to commercialize ideas, attract investment and serve as a test bed for new unproven technologies is underpinned by a regulatory framework that is credible, reliable and forward-looking. One important area of action focuses on ensuring that Canadian laws, regulations and standards keep pace with rapid change, while protecting consumers. The goal is to ensure that the market is favourable to the adoption of new technologies. Government has a role in promoting innovation as well as a business environment that supports commercialization and the freedom to compete in a global economy. All levels of government must work together to lower barriers to allow Canadian businesses to prosper at home and abroad. How can regulations be designed and used to drive innovation across key sectors? What new approaches could be explored to improve government services to businesses? Who are the partners?